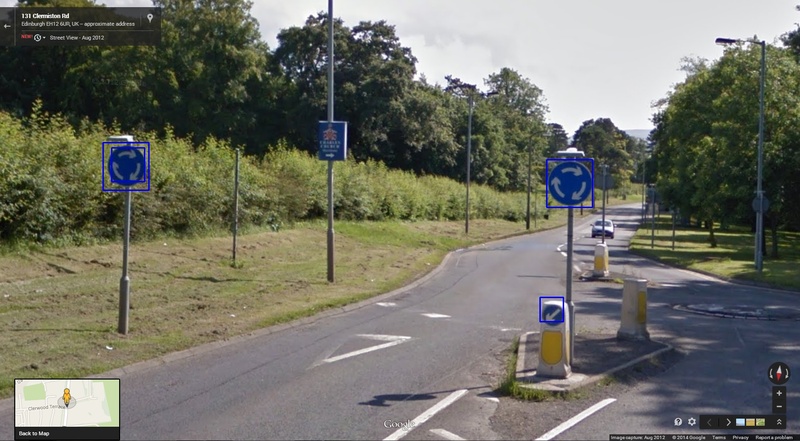 Oops, we are now detecting a ‘keep left’ road sign, as well as the roundabout road signs. By adjusting the minNeighbors parameter to make object detection less strict, we have inadvertently introduced a false-positive. Why not just leave the minNeighbors at 6? you ask me. 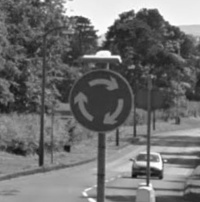 Problem is, by being so strict with this setting we may fail to detect roundabout signs in other Google Street View snaps. So let’s try a different approach – let’s set minNeighbors to 3 and then treat each detected object as a ‘candidate’ for a roundabout sign. This candidate can then be inspected, to ensure it is actually a roundabout sign. Now, there are many OpenCV techniques we can use to inspect these candidate objects. Here I am going to use OpenCV ORB, which is one of a number of feature detection and description algorithms that we can match images on. First up, I load the roundabout cascade and the Google Street View photograph. I use the aforementioned OpenCV detectMultiScale function to detect all roundabout objects in the street snap. Now we get to the OpenCV ORB stuff. I create an instance of ORB and a matcher. I use the object’s coordinates to obtain its image from the street photograph. 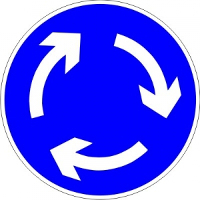 I resize the object image, to bring it inline with our roundabout image. I use ORB to obtain the keypoints and descriptors of the object. Now we can match the descriptors of our object with our roundabout image. All that’s left is to draw a rectangle around our detected object, on the street photograph. But the object needs to pass the match threshold for this to happen! 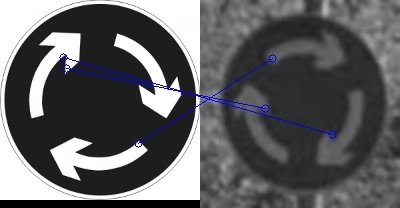 So you see, OpenCV ORB has determined which of our candidate objects are actually roundabout signs. 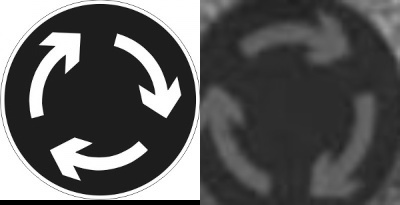 If fewer than 3 matches are found between our object and the roundabout image, the object is discarded. Our next object is a roundabout road sign, but no matches are found. Perhaps it’s because the object is not a full sign i.e. its border has been chopped off? Luckily, our third object is of the same sign, but this time we can see its border. Matches have been found! 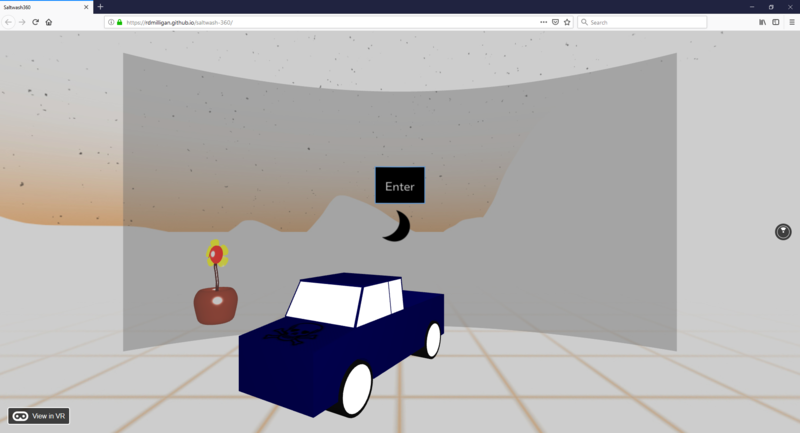 So there you have it – OpenCV ORB has helped us to detect road signs! 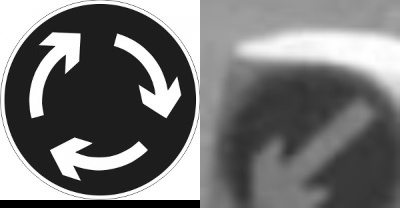 Notice how ORB’s rotation invariance has matched the arrows on the detected objects, which are upside down compared to roundabout image. Of course, there are other feature detection and description algorithms to try e.g. 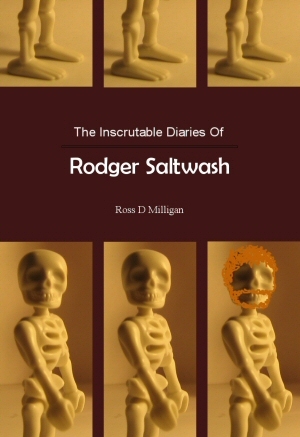 where scale invariance may avoid the need for image resizing. There are parameters we can tweak on some of the function calls. There are alternative techniques to evaluate our matches (than simply using a threshold). We need object detection to work well across all Google Street View photographs. But it’s been a promising start. A stackoverflow post provided some options for drawing matches, if you don’t have OpenCV 3.x. I plumped for the code provided by rayryeng. Thanks for using my drawMatches function 🙂 Very interesting post! Consider color in two variants black​white and black​yellow. Using ORB algorithm you should detect and recognize the signs on images. You should teach him to recognize them. If we consider all walls in the rings with numbers from 1​­​12, then for example sign(0000,0000,0001) where 1 means that there is a wall (number 1) inside the ring and 0 means there is no wall. When sign(0000,0000,0010) there is only one wall (number 2) inside ring. In case when we have sign(0010,0111,0111) ​means there are following walls (number 1,2,3,5,6,7,10), etc. 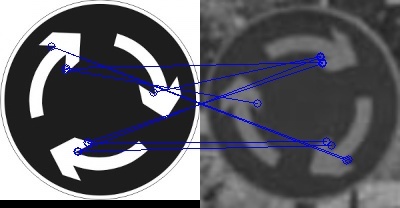 Ah, you mean 2D marker detection – check out my post Glyph recognition using OpenCV and Python. 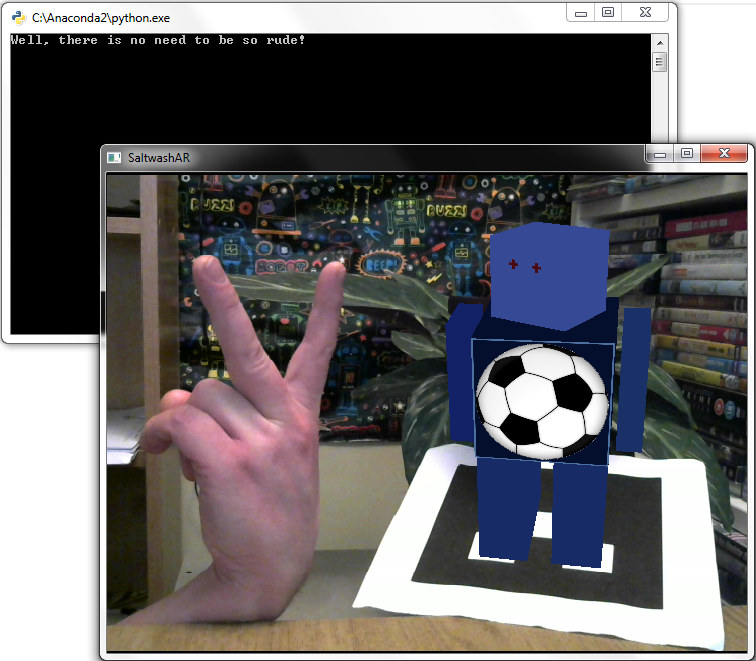 I have used 2D markers to project 3D robots upon for SaltwashAR, the Python Augmented Reality app. You could use colour detection between black​white and black​yellow – but it may be more accurate just to have more patterns on black​white. I’m using this code ( https://www.dropbox.com/s/jcw7ja7f0nne6xm/orb.py?dl=0 ) on RPI with webcam and it is working well, but I’m not able to add a rectangle over the tracked image in the webcam window. I’m guessing that you have the lines displayed okay. The reason I have rectangles is because I’ve combined ORB detection with Haar detection – Haar provides the x,y,w,h of each road sign in the image, to draw the rectangle. Maybe you could calculate the points of a rectange from all the pt_a values in your code i.e. the most-top-left pt_a and the most-bottom-right pt_a? Is there a straightforward way of doing that? Could you think at an example please or a link with an example? The only experiment that I’ve done is rectangles from each pt_a to each pt_b but is rubbish :)). What numerical value are you getting for len(matches)? The MATCH_THRESHOLD can be adjusted to suit. Would you please help to understand how I can create ‘orb/repository/haarcascade_roundabout.xml’ file for my traffic sign? Now I want to modify the haarcascade_roundabout.xml for it can recognise my own type traffic signs. Could you please help? Hi. My Guitar detection using OpenCV post has detail of how to get started (done a ton of other posts on haar cascades too). Is it possible to get your training data for Haar classifier? If not, can you please tell what was your positive and negative images sizes and the training w/h parameters values? Hi. The first link in this post has detail of the roundabout training. Don’t have the training images, sorry. Does it detect road signs using Haar classifier, before using ORB? Try drawing rectangles on street image before ORB to see ‘candidates’. Ah okay, so just need to improve matching. Are you using my images (roundabout and street view)? If so, you should get the matches I got. Hi. The OneDrive link is working, for getting roundabout cascade and Google Street View photographs. I tried your approach and I get a match as long as my reference image has a similar or close enough texture to my test image. Is there anything that I can do to better train my ORB detector to discard the false-positive detections? Hi Hayley. I’ve not tried any further testing with ORB, sorry, but might be worth digging into the configuration options. The tutorial uses Haar classifier to filter candidate images for ORB – there may be other OpenCV techniques that can be used in conjunction with ORB to discard false-positives e.g. if lighing conditions okay then even simple colour detection might help?